Rafting is a fantastic opportunity to see the Land of the Thunder Dragon in a way that few people ever have. Not many people have seen a Dzong from below, perched 100s of feet on a cliff. Our itineraries will not overwhelm you with the prospect of paddling class 4s straight away. Instead we will introduce you to the waters at a very comfortable pace, with enough time to explore the quaint little towns that dot the country. When you are truly enjoying the adrenalin rush, our ever helpful staff will be there to take care of your other needs like arranging picnics and setting up camps wherever needed. Experts have suggested one of the best rafting/kayaking tips as follows. Travel over a 12,000 foot pass into Haa valley, which has been opened recently to tourists. 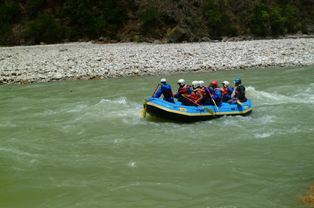 Then down the put in of the Amo chu/river and on to the border of India, passing through all of Bhutan’s diverse ecosystems into some of the best jungle left in the Himalaya. The Amo Chhu flows out of the high Himalayas of Tibet and down onto the Indian plain, crossing the southwestern corner of Bhutan thru the Haa Valley. The lower section is a wonderful Class III + trip suitable for intermediate kayakers and novice rafters. The water quality is spectacular - clear, clean and fast, a beautiful way to explore this remote region. How to Reach Bhutan ?